A court of criminal appeals has ruled that organizers of the petition apologizing for the Armenian genocide (drafted in Dec. 2008) cannot be tried under Article 301. In Jan. 2009, six Ankara residents launched a criminal complaint alleging the violation constituted an insult to the "Turkish nation," still considered illegal under the auspices of the infamous article in Turkey's criminal code and despite cosmetic revisions made in April 2008. Click here for the article from Bianet. 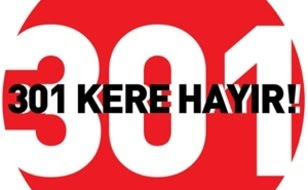 Click here for background on the 301 case and here for background on the petition in the context of intellectuals and activists tried since the 301 reform. For more information Article 301 generally, see past posts. Under the reformed 301 Law, the Ministry of Justice, specifically the Directorate General of Criminal Affairs, must approve a criminal complaint before it becomes a case. My knowledge of Turkish criminal procedure lacking, I am assuming this happened with the petition organizers since the complaint ended up before the Sincan 1st High Criminal Court. It was at this stage, I believe, that the Ankara prosecutor's office decided to file the order of nolle prosequi, effectively dropping the case. However, the court in Sincan refused to drop the case, leading the Ankara procesutor's office to appeal to the case to the Court of Appeals 9th Criminal Office, which issued the ruling released this week. If I am wrong, I would most appreciate it if someone correct me.